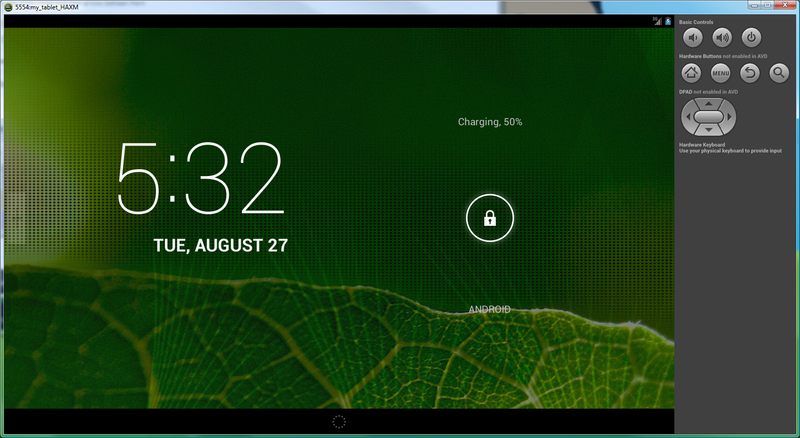 The typical experience with the Android Emulator on Windows is that it is essentially unusable. But if you throw hardware acceleration into the mix then it becomes possible to get the emulator working quite well – well enough for everyday use. The cause of the emulator’s lack of performance is due to it being implemented completely in software. However, Intel has a set of hardware accelerator drivers called HAXM for computer’s utilizing it’s chips. 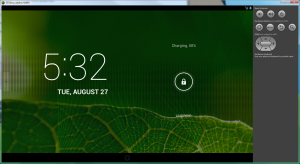 The caveat is that your Intel processor has to support Intel’s Virtualization Technology (VT) in order for the drivers to work. 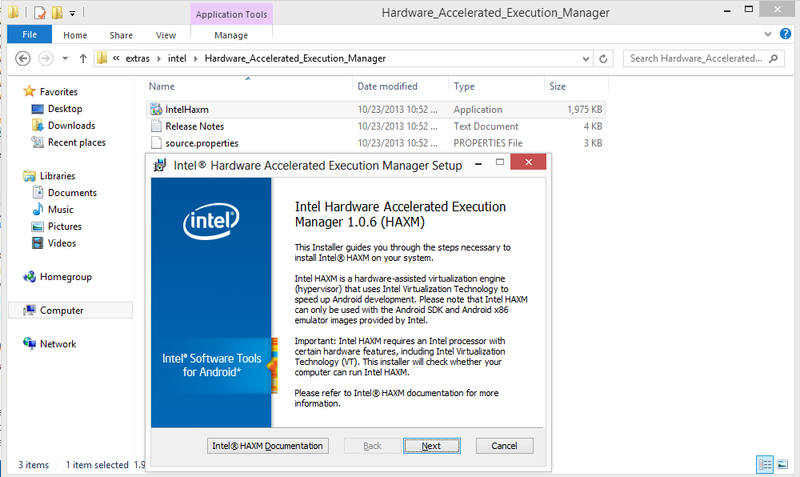 See this link – Microsoft® Hardware-Assisted Virtualization Detection Tool – to see if your system supports Intel’s VT.
You can install HAXM through the Android SDK Manager (Within Eclipse, go to Window > Android SDK Manager and look for “Intel® Hardware Accelerated Execution Manager” under the Extras folder and install it) or via a separate download/install file. 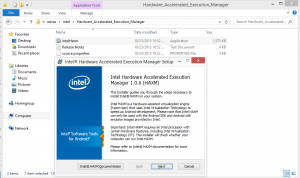 The following link describes both: Installation Instructions for Intel® Hardware Accelerated Execution Manager – Microsoft Windows*. You can see that the file you want to execute is IntelHaxm.exe. 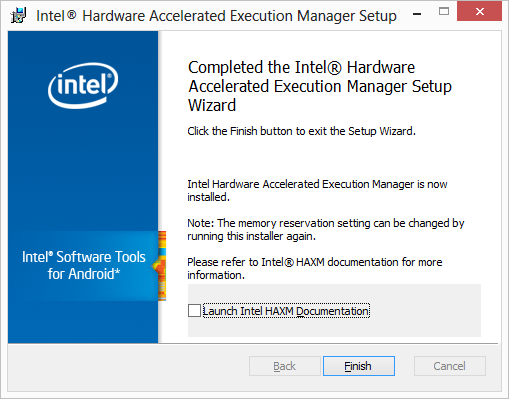 When I clicked the OK button the install failed – the Intel VT must be enabled first before you can install HAXM. While researching how to do this I came across a blog post that said some people’s Windows 8 machines would no longer detect USB devices after enableing VT. The fix that worked for that particular blogger (and others) was to disable fast boot. Not wanting to fall victim to this bug I went ahead and disabled that feature. If you are in Windows 8 and would like to do the same you can do so in Control Panel, under Power Settings, select the option of choosing what the power button does. Disable the “Fast Startup” option. Anyway so now I have to enable VT which by the sound of it means that I have to boot into my system’s BIOS. You will have to search on how to do this for your particular machine, but for my Lenovo IdeaPad Y410p i just had to hold down the F2 button during bootup. Once I enabled VT in the bios and rebooted I was able to complete the HAXM install. Once HAXM is installed you’ll want to create a HAXM-enabled AVD, here’s the walk-through on how to do so. 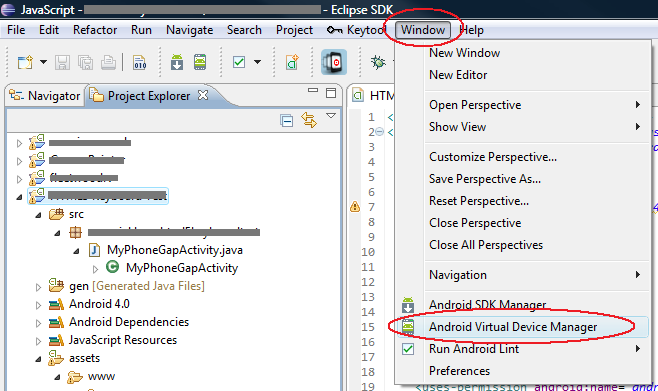 Start Eclipse and select Window > Android Virtual Device Manager. Click “New” to create a new Virtual Device. 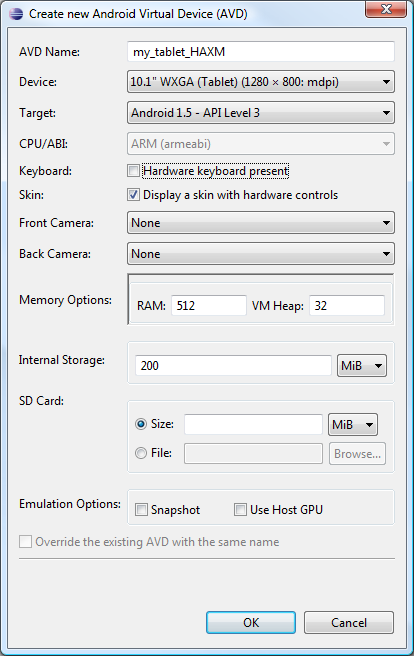 The “New AVD” window is where you setup the AVD and specify that you want to use HAXM. 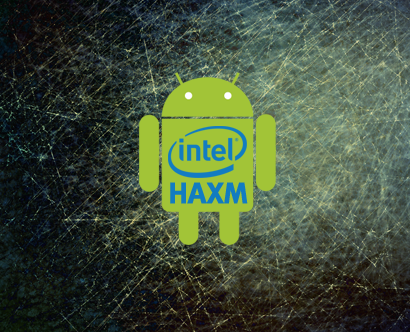 Note that HAXM is only available for Android 4 and higher. If you set your Android Target to anything below then HAXM will not be available to you. The first thing to do is to give your AVD a name. As this will be a HAXM accelerated AVD I personally like to use “HAXM” as part of the name. In this case I’ll call the project “my_tablet_HAXM” (note that spaces are not permitted thus the underscore characters in the name). 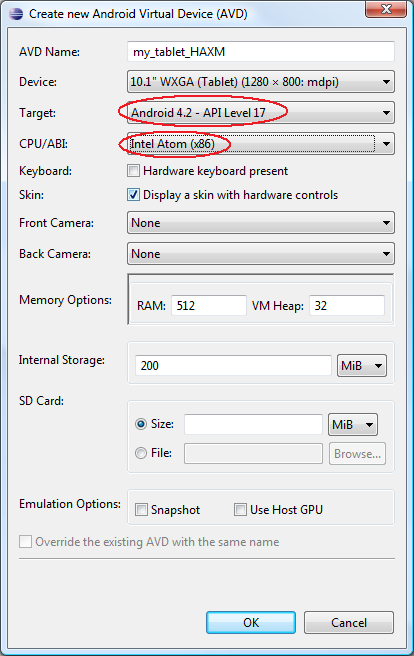 To use HAXM you must change the “CPU/ABI” field to “Intel Atom (x86)” however you will see that the “CPU/ABI” field is greyed out. HAXM is only available on API level 15 (Android 4.0.3) and higher. Ours is currently set for something much lower so lets bump up the “Target” to 17 (Android 4.2). Now you can change the CPU value to x86. 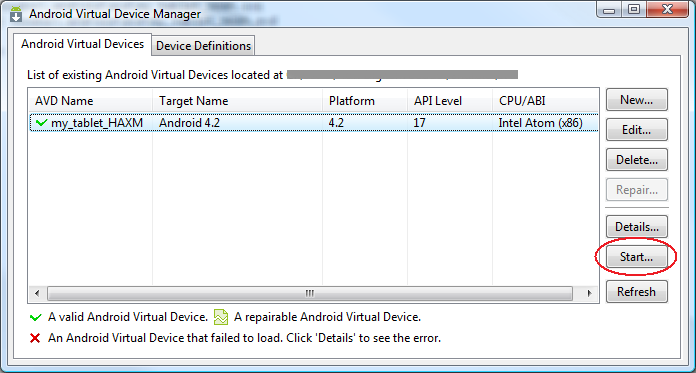 If however you see the text “No system images installed for this target” in the “CPU/ABI” field you need to go to your Android SDK Manager and install the x86 images for the version of android you’re attempting to use. 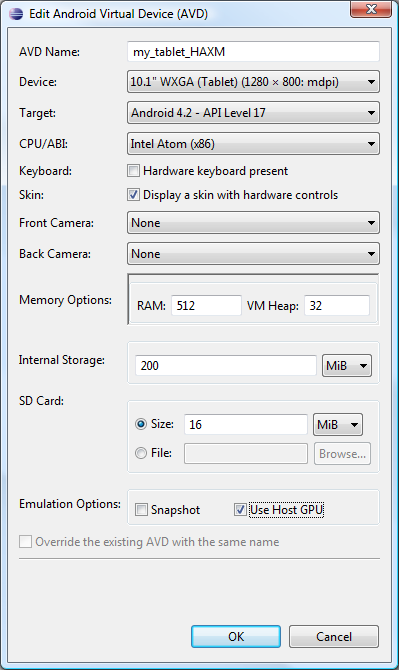 Once you do that then return to this step and you’ll be able to select “Intel Atom (x86)”. In memory options you can go as high as 1024MB of RAM. I’ve left it as is – half of that at 512 – feel free to go to 1024 but don’t exceed that number as you wont see any benefit. In the “SD Card” section you will want to give your AVD some memory to store whatever it is your app might be doing – the default seems to be 9mb (if you don’t enter a value). I’m going to enter an arbitrary value of 16MB. 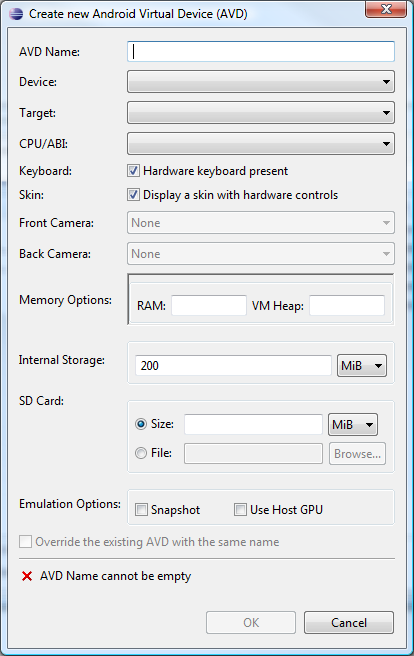 Next at the bottom are 2 options – “Snapshot” and “Use Host GPU”. “Snapshot” retains the state of your application so that programs installed in one session carry over to the next thus behaving just like a real device. Otherwise whatever you install/configure will be cleared when you shut down the emulator. “Use Host GPU” is the switch that enables hardware acceleration and utilizes the GPU to speed up screen rendering for Android 4.0.3 (API Level 15, revision 3) or higher. We’re using a target level of 17 so we meet that requirement. Note that as of API Level 17 GPU acceleration is experimental so if you encounter some oddness (i.e., screen flickering) its most likely due to your enabling HAXM for your AVD. 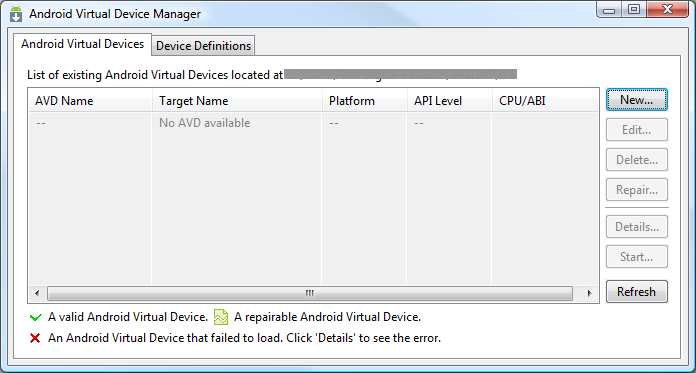 Click “Ok” and your new AVD is added to the AVD Manager. You now have this AVD available to you whenever you want to test your apps. If you like you can kick the tires to see how it performs by selecting the new AVD from the list and clicking the “Start” button. You’ll have some Launch Options appear, go ahead and skip the options by clicking the “Launch” button. From here go ahead and play with things – there’s a marked improvement in performance. 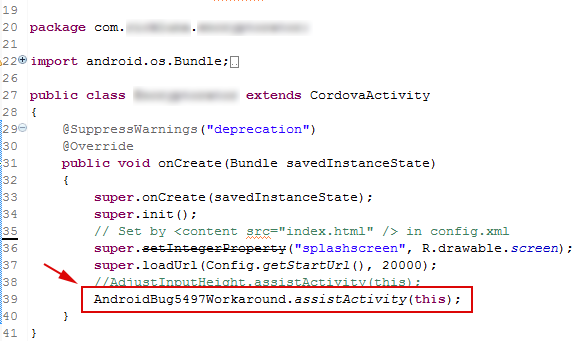 In PhoneGap 2.8.1 they have added a “preference” to config.xml for screen orientation, but oddly it doesn’t seem to work on the Android 4.1.1 test device I have (a Samsung Galaxy Tab 2). Simply add it above the feature tags in config.xml… but as I mentioned, it doesn’t work. 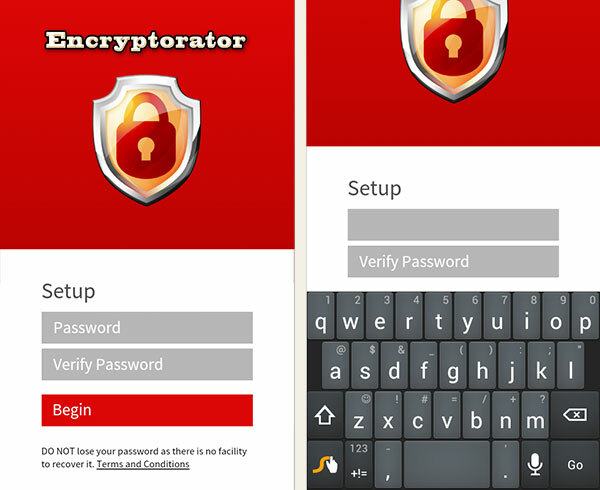 Maybe this is forward looking or maybe its broken in PhoneGap 2.8.1, either way the first method continues to work. By default all Android devices will only install applications from Google Play. 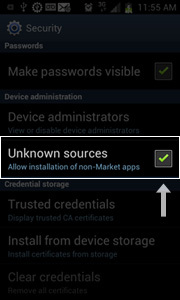 To install an APK outside of Google Play you must enable the ability on the device. 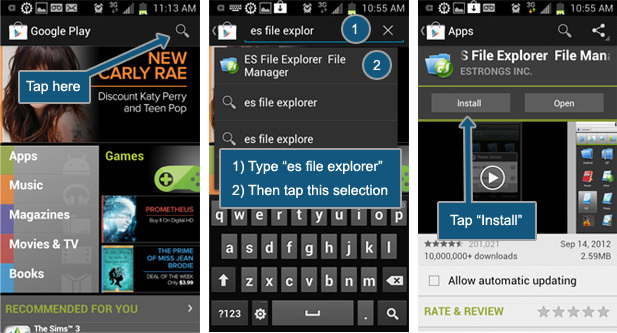 Download a File Manager so that you can browse your file system to locate and install the APK. There are two good free file managers in the Google Play market, one is “Astro” and the other is “ES File Explorer”, I prefer the later. 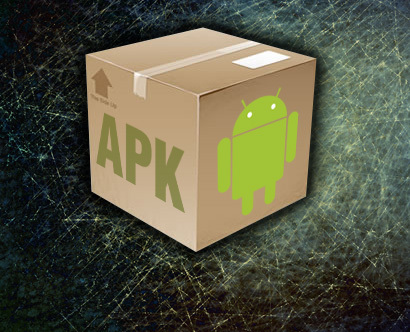 Once you locate the APK simply tap it and install.